Winter blues? Not here. Boston’s premier builders, architects and specialists have conceived some pretty amazing ways to embrace the great indoors—and we’re looking to them for inspiration. Now, we’ll grant you that the projects featured below are pipe dreams for most, but they sure are fun to look at, and got us thinking about real-world solutions to combatting a midwinter funk. #1) Work on your swing. 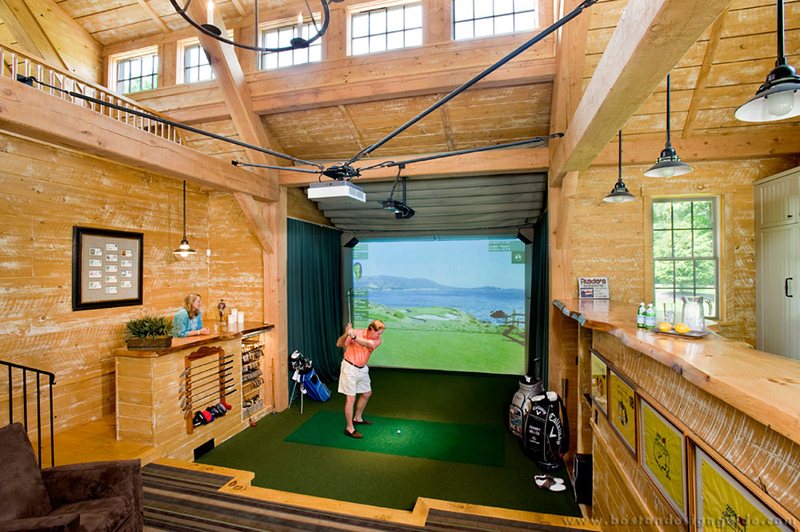 To house a HD golf simulator for a family of champion golfers, Meyer & Meyer Architects created an entertainment barn for the high-tech toy, complete with spectator seating and fireplace dining. REAL-WORLD ALTERNATIVE: Hang a net in your barn or garage and swing away with soft practice golf balls. 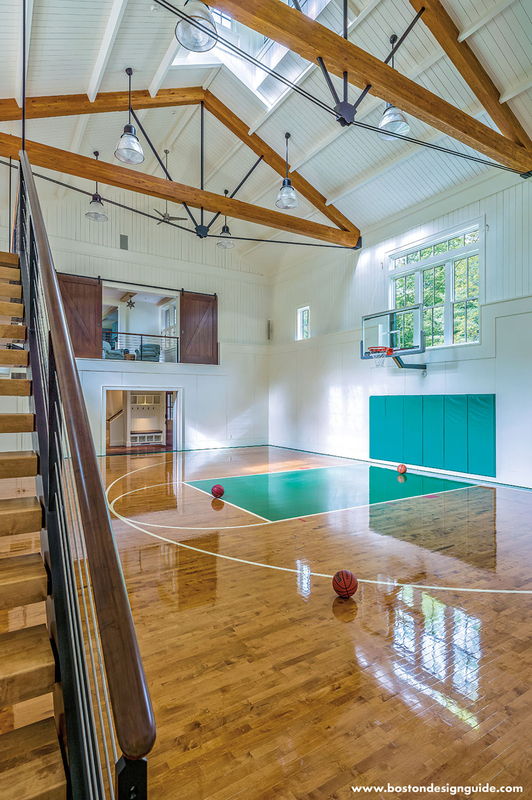 MGa | Marcus Gleysteen Architects gave a family in Weston the home court advantage, designing a full-sized basketball court in their outdoor barn. A second-level living room with sliding barn doors gives a view of the game. REAL-WORLD ALTERNATIVE: Cambridge Athletic Club has daily basketball pick-up games (M-F noon-2pm, and 6-8pm, Sa-Su 11am-2pm); nonmembers can play for $10. #3) Get in the game. 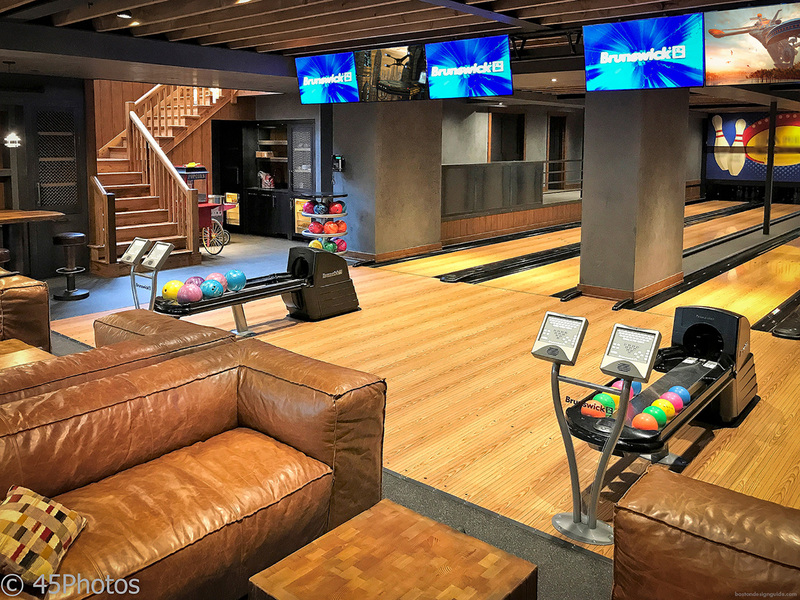 Stefco Builders took a custom game room to new heights. 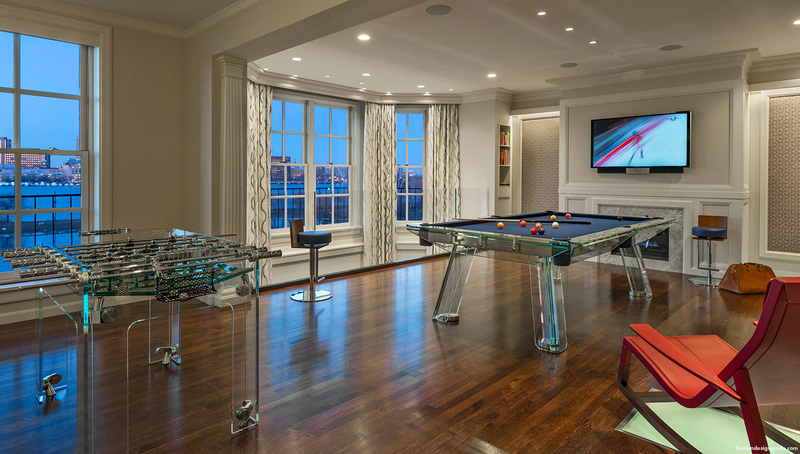 Overlooking the city, this ultimate entertainment space features matching Lucite foosball and pool tables, scattered seating and a large-screen over the fireplace. REAL-WORLD ALTERNATIVE: Gather some friends for a game of pool, darts and/or old-school video games at Flat Top Johnny’s in Cambridge. #4) Take a tub…or spa. 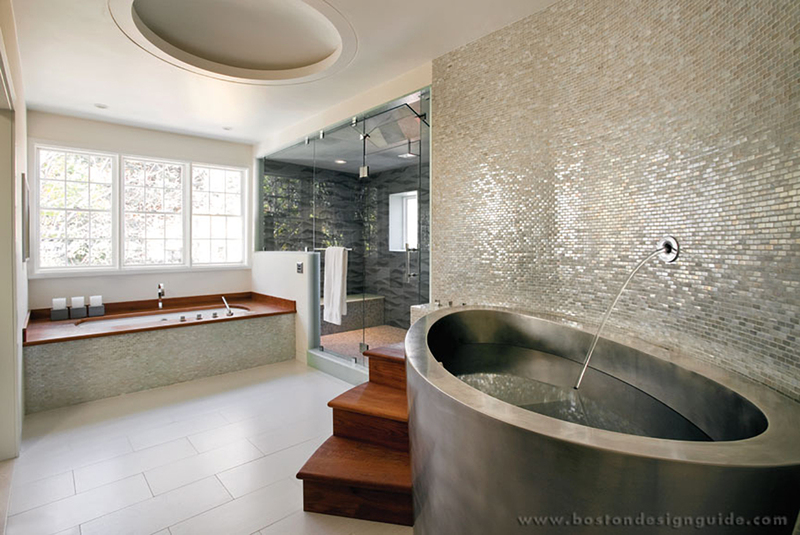 Kenneth Vona Construction’s beautiful master bath is every bit as restorative as a high-end spa. The soothing oasis features a steam shower, jacuzzi and a soaking tub you have to step in to. REAL-WORLD ALTERNATIVE: Make a production out of drawing a hot bath. Buy a teak or bamboo bath tray if you don’t have one, light some candles, pour a glass of wine and linger so long it feels like a luxury. #5) Bowl a few frames. DC Home Systems wired the home automation for this award-winning “Playhouse” designed by TMS Architects. Along with a cinema space and gaming room, the building features a professional four-lane bowling alley. REAL-WORLD ALTERNATIVE: Round up the troops and hit the lanes at Lucky Strike by Fenway Park for fun for the whole family. Go on the early side; after 8pm, it’s ages 18+ Su-Th, and 21+ F-Sa. The owners of this pool can go for a dip no matter the weather, thanks to Combined Energy Systems. This picture-perfect natatorium is filled with natural light and plenty of places to lounge poolside—without sunscreen. REAL-WORLD ALTERNATIVE: Atlantis Sports Clubs at the Hyatt Regency in Cambridge offers monthly swim memberships as well as free guest passes online for those looking to make a splash. Creative Systems’ in-home theatre is worthy of the red carpet with its amped-up audio, mind-blowing visuals, cove lighting and stadium-style reclining leather seating. REAL-WORLD ALTERNATIVE: Be choosy when selecting your cinema, since you actually have to go to the movies. Regal Cinemas Fenway or Showcase SuperLux in Chestnut Hill have comfy recliner seating and full service dine-in. #8) Warm up by the fire. 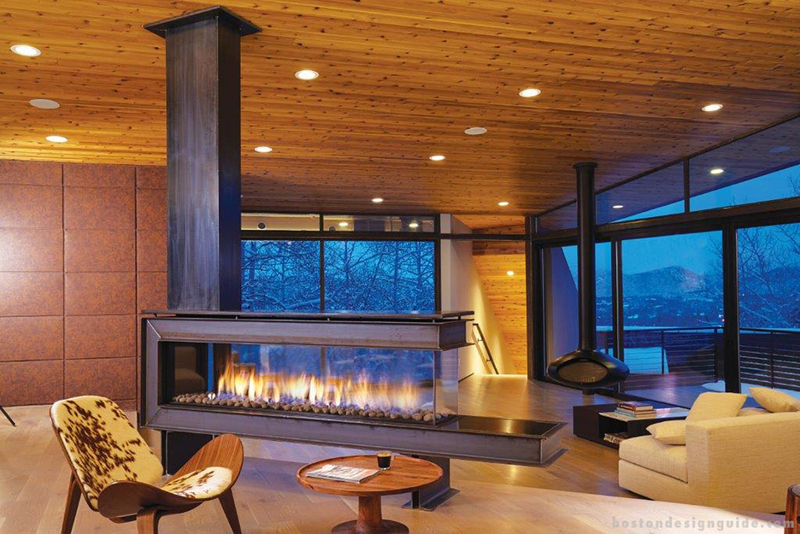 Commonwealth Fireplace’s see-through glass hearth gives homeowners plenty of reason to gather within this cozy living space, featuring great views inside and out. REAL-WORLD ALTERNATIVE: Sip a drink fireside. Sleek yet inviting, The Ritz-Carlton’s Avery Bar serves up craft cocktails in a mid-century modern setting highlighted by a dramatic oversized fireplace. 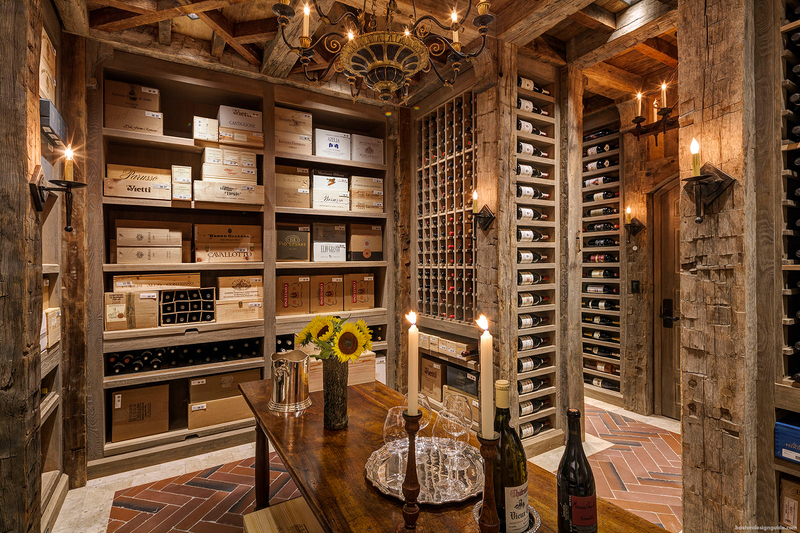 It’s only fitting that a stunning French Normandy residence in Greenwich, Connecticut, conceived by Charles Hilton Architects, would have a perfectly intoxicating wine cellar to match. Like the rest of the farmhouse, which is laden with hand-hewn timbers, this custom space is oaky and enchanting and ready for a toast. REAL-WORLD ALTERNATIVE: Brix Wine Shop in the South End, Financial District, and now on Nantucket, offers weekly wine tastings that are festive, educational and complimentary. Cheers! 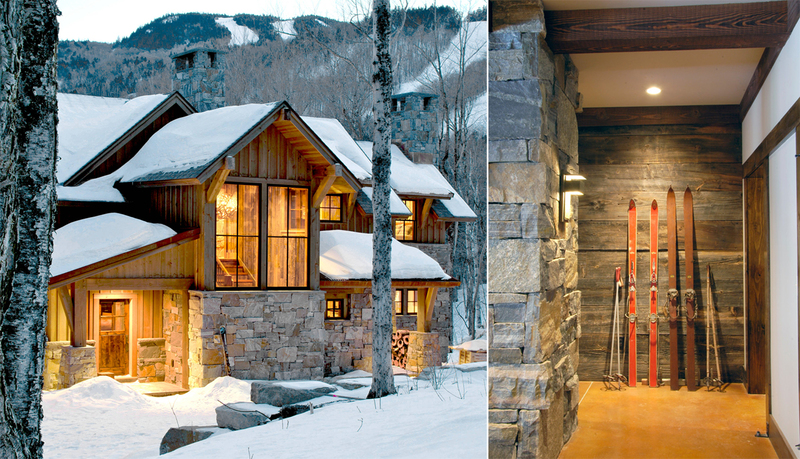 Homeowners and their guests can ski right up to this trailside ski chalet, designed by Rob Bramhall Architects. This Northern beauty is a stunner to be sure, and has banks of rear windows with sweeping views of the mountain. REAL-WORLD ALTERNATIVE: Plan a day trip and go skiing. Your drive time should depend on your skill level. While beginning skiers can do just fine at nearby Wachusett Mountain, expert skiers should make the 2 to 2.5-hour trek to Mount Snow, Mount Sunapee, Loon Mountain or Waterville Valley.